Restaurants and cafes are popular places for recreation, relaxation, and are the scene for many impressions and memories, so their construction and design requires special attention. Restaurants must to be projected and constructed to be comfortable and efficient. 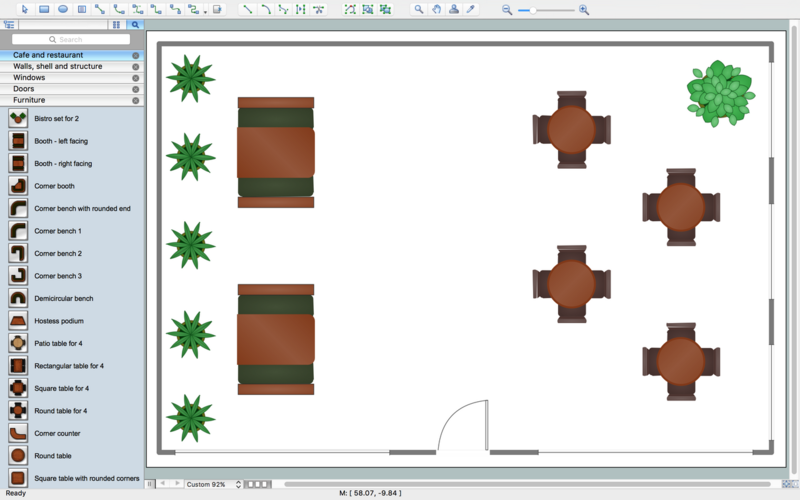 You do not need to be an artist to create great-looking restaurant floor plans in minutes. 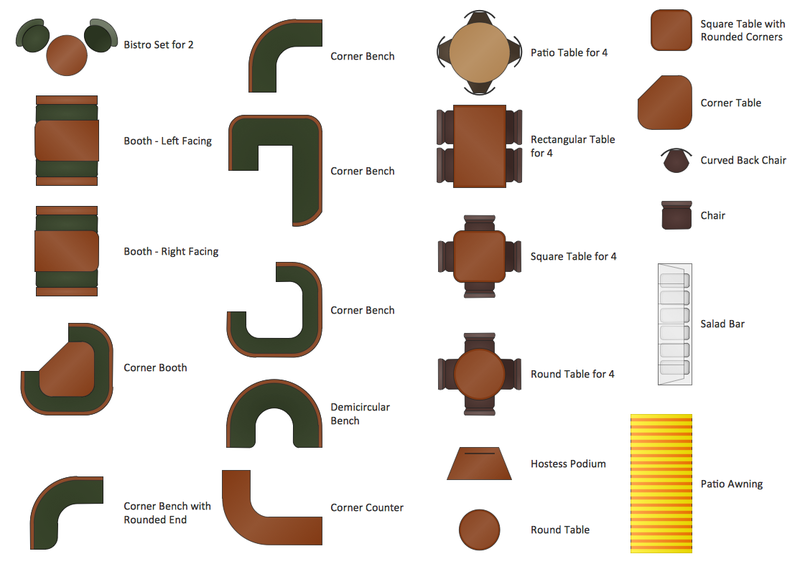 many examples and templates for drawing floor plans and restaurant layouts. The ability to design a restaurant or cafe floor plan drawings is delivered by the Building Plans solution. This solution extends ConceptDraw DIAGRAM with 49 libraries that contains 1493 objects of building plan elements. Open the Cafe and Restaurant Plans Template from the Buildings Plans section. This restaurant floor plan template provides a horizontal document orientation, appropriate snap and glue settings, and opens a set of libraries containing objects, which are useful for drafting layouts. The template makes it easy to quickly and easily draw restaurant floor plan. Use Clone tool (Mac), (PC) to quickly add copies of the selected object. You can use a multiple layers when creating different parts of your floor plan. ConceptDraw DIAGRAM allows you to create as many layers as you need. Result: This article is helpful for those, who use ConceptDraw DIAGRAM to design or modify their own restaurant or cafe floor plan. Contains 22 vector symbols from the Cafe and Restaurant library. This example was created in ConceptDraw DIAGRAM using the "Cafe and Restaurant" library from the Cafe and Restaurant Floor Plans solution and “Trees and Plants” library from the Site Plans solution. It helps make a layout for a restaurant — cafe floor plans, bar area, floor plan of a fast food restaurant, restaurant furniture layout, etc. An experienced user spent 15 minutes creating this sample. This sample shows a restaurant floor plan. 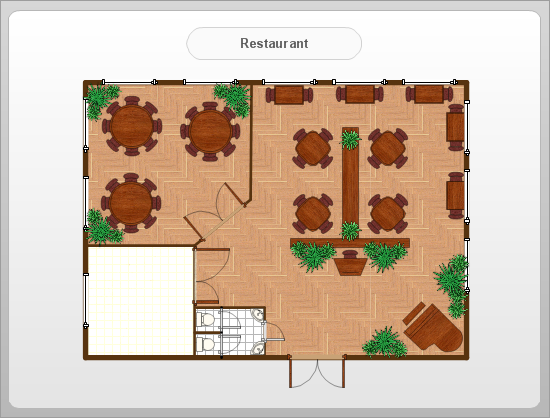 ConceptDraw DIAGRAM — great restaurant floor planner, allows you to choose the furniture for your taste. Use the tables from the Library and arrange the furniture as you desire. 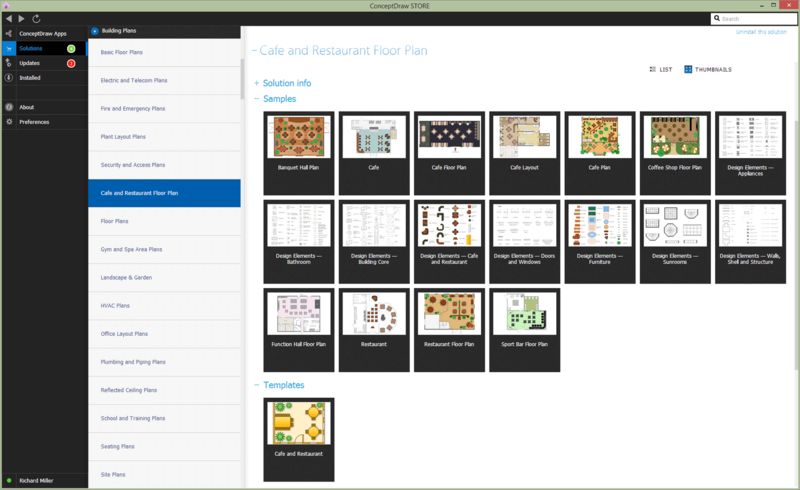 ConceptDraw DIAGRAM — great restaurant floor planner. 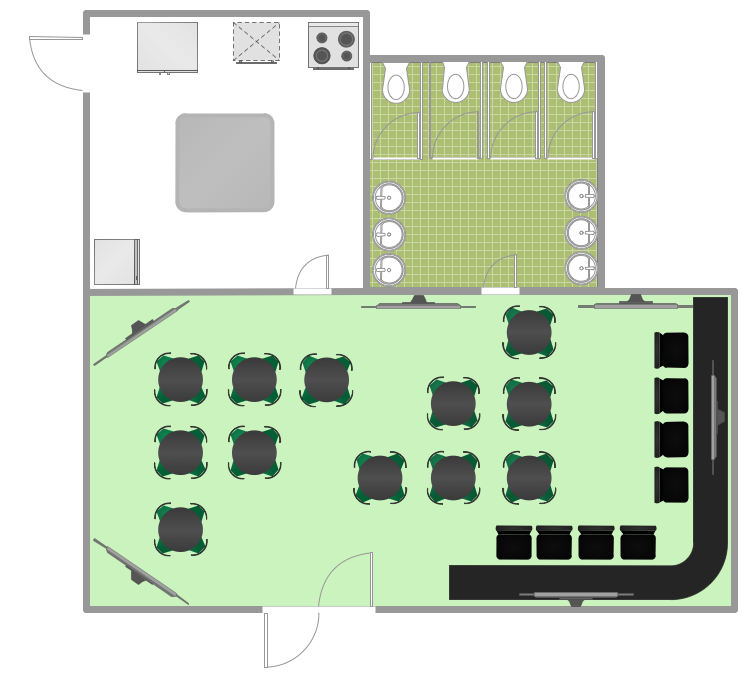 You do not need to be an artist to create great-looking restaurant floor plans in minutes. ConceptDraw DIAGRAM is great for making restaurant floor plans, create furniture layout, make floor plan of a fast food restaurant, make bar floor plan. ConceptDraw DIAGRAM — great restaurant floor planner, make professional looking diagrams in a few minutes.